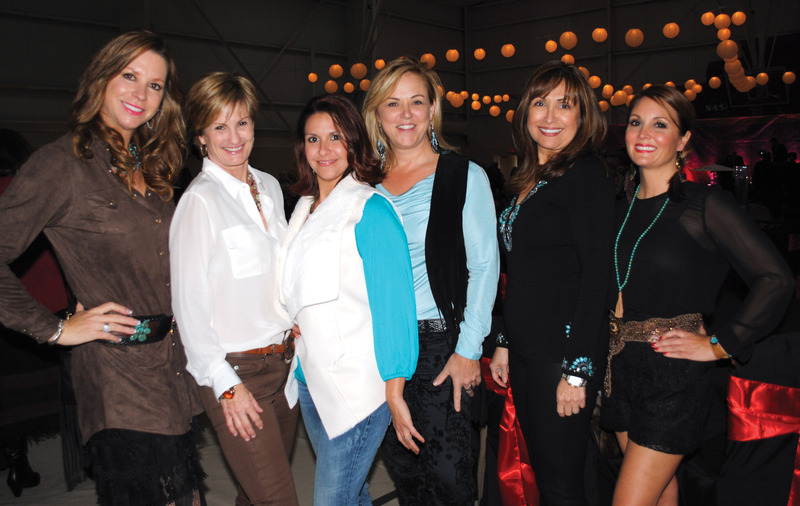 Jeri Knapp, Jan Bailey, Claudia McCollom, Krista Williamson, Angie Weinman and Wendy Shaw can hardly wait for the 49th annual Rodeo Style Show to begin. TIME TO RODEO. 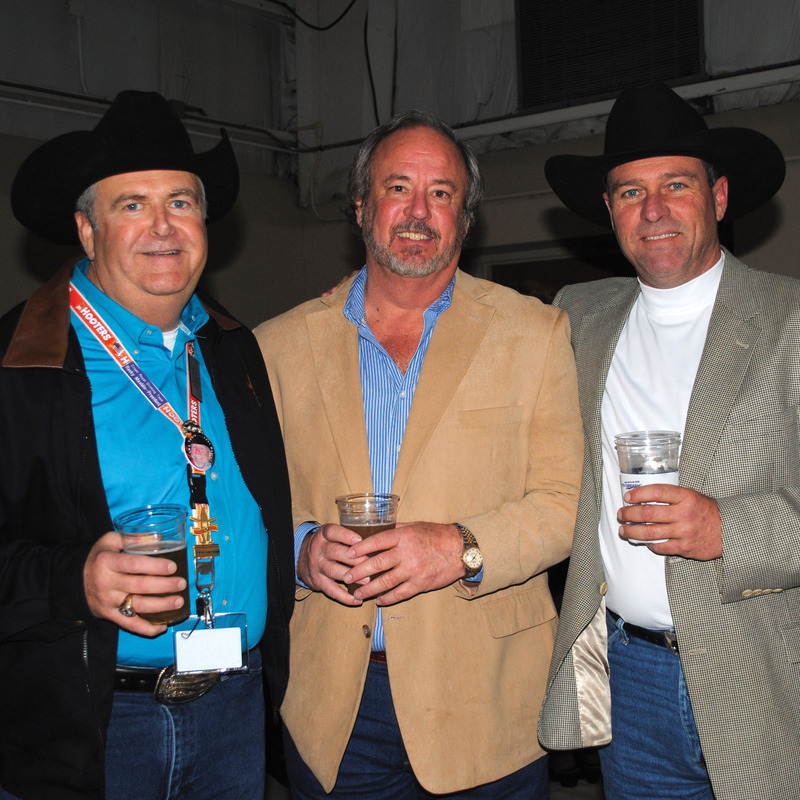 The call went out all over the Bay Area, and before long NASA’s Gilruth Center was overflowing with cowboys and cowgirls ready to party down and enjoy the Clear Lake Go Texan Rodeo Style Show – now in its 49th year! Ange Mertens was chairman of this year’s extravaganza with fashion guru Lenny Matuszewski assisting the models backstage and Phil Pampolino serving as emcee. Early arrivals for the always-fun event included Angie Weinman, Joy Smitherman, Emmeline Dodd and Gene Hollier, Jill Reason, Pam Culpepper, Judy Raiford, Pam Ploss and Mike Hesse. 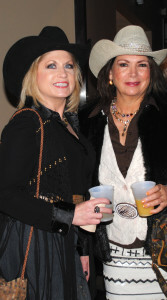 Tamra Gann Curry, left, and Kathleen Courville arrive at NASA’s Gilruth Center for the Go Texan Rodeo Style Show. Before long, the fast-stepping models were coming down the runway, showing off the latest in fashion from area boutiques – much to the delight of sisters Carol Bergman and Sally Wigginton, Rocky Mauldin, Jeff DeWease, Steven Kirk, Kathleen Courville, Tamra Gann Curry, Joan McKinney, and Cindy Harreld. Celebrity models included League City Mayor Tim Paulissen, Judge Holly Williamson, League City Councilman Keith Gross and his wife, Kellie, Nassau Bay City Manager Chris Reed, Miss Kemah USA Associate Pageant Director Kelly Williams, former Texans cheerleader Lauren Leal, Mrs. Texas-USA Summer Williams, Texas Star Realtor Candace Sheffield, NASA Engineer Jessica Curry, and Clear Lake Area Chamber VP Shari Sweeny. Plus, Kendal O’Sullivan, Garza West Isle Urgent Care; Rachel Henson, Bayway Group; Jeremiah Corbin, Texas Wealth Management; Josh Leal , actor; Karen Jordan, ATA; Gloria Jaramillo, Heather Burchfield, Barrios; Ellen Hickl; Leslie Rauscher Sawyer, Jill Rauscher School of Dance; Jeff Moore, Top Gun; Todd McIntosh, Space City Automotive; Shane Martin, Santa Fe Realty and fireman , and Arlette Baudat, Oceaneering Space Systems who has modeled in the show for over 20 years. Others in the crowd included Wendy Shaw, Jeri Knapp, Claudia McCollom, Jan Bailey, Olive Murphy Riker, Dedra Flynn, Ginger Gibson, Sandy Mossman, Jill Reason, Debby Reichert and Michelle Richardson. KEMAH is building quite a reputation as a Mardi Gras destination with the Kreme du Lac inviting one and all to its “Krewes into Kemah” month-long celebration. 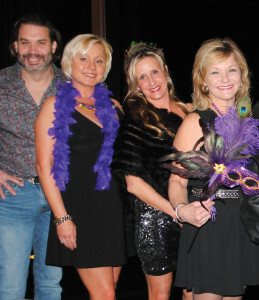 Larry and Betty Hays reigned as king and queen over this year’s Royal Gala with Princesses Marilyn Cole, Connie Mack, Karen Mignola and Sherri Short as Kelly McGuire’s Band kept the ballroom rocking. Krewe du Lac 2015 King and Queen Larry and Betty Hays, left, join Princess Connie Mack for a photo at the Royal Ball at Landry’s in Kemah. Now, after they’ve rested up from all the fun, they’ll start planning for next year’s Mardi Gras in Kemah, hoping you’ll join them. THE HOUSTON Symphony League Bay Area’s annual home tour will be April 11-12 this year, and getting it on our calendars now will make it helpful to remember. Last year, with the West Mansion on the tour, there was a huge turnout, and this year will be just as exciting with two historical properties (Windemere and Bay Area Museum); three Brook Forest renovations; and two waterfront properties. They invited the community to join them for a fabulous day finding and adapting new ideas to use in our own homes. Keep watching for more information the next few weeks. THE 2014 Lunar Rendezvous Festival distributed a record-breaking $180,000 to charitable organizations and for college scholarships when it returned its proceeds back to the community at its annual distribution of funds. 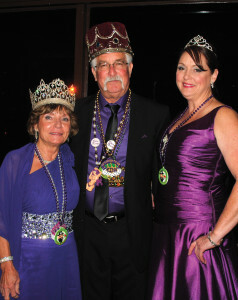 Mardi Gras revelers, Mark Lovfald, Bobbie Coan, Shannon Alexander and Debbie Salisbury, from left, were among the arriving crowd at the Kemah Krewe du Lac’s Royal Ball. Under the direction of General Chairman Lea Bodie, the 49th festival was the most successful festival since it began back in 1965. Part of the $180,000 was given to Clear Creek ISD for 25 two-year $4,000 scholarships for 2015-2017 — to be presented at each high school’s award ceremony in April. Bodie and Advisory Board President Mike Reeves distributed the funds to 20 other local non-profits and cultural arts organizations. The amounts of the donations were between $900 and $26,975. This includes sending students from Clear Brook, Clear Creek, Clear Falls and Clear Lake High School to Girls and Boys State and HOBY Youth Conference. It also includes a donation to UHCL for an Art Gallery, Nights in a shelter for Bay Area Turning Point, Assistance League of Bay Area for Operation School Bell, the Bay Area Museum Guild, Bay Area Youth Symphony, Clear Creek Education Foundation, Friends of Evelyn Meador Library, Houston Bay Area Young Life, Armand Bayou Nature Center, Right at Home Moms, Ashlyn Would Go Foundation, Bay Area Houston Ballet & Theater, Communities in Schools-Bay Area, Jill Rauscher School of Dance and the Bay Area Museum Operating Fund. FIVE CLEAR CREEK ISD students have been awarded scholarships from the Space Center Rotary Club. Four seniors from Clear Brook High and one from Clear Lake High each received a $1,500 scholarship during the luncheon held at Bay Oaks Country Club in Clear Lake. Superintendent Dr. Greg Smith was on hand to congratulate the students for their selection as Rotary Scholarship honorees. Recherche members get together for a luncheon at Frenchy’s in Clear Lake. They are, from left, front, Barbara Phillips, Alice Marinos, Ann O’Malley, Charlene Miller; back row, Mary Alys Cherry, Dollie McAlpin, Peggy Morrow, Mary Ann Shallberg, Kippy Caraway, Marcelle Lovfald Ho and Audrey Lovfald. Several plan careers in the medical field. Clear Lake High senior Rachel Lopez hopes to study psychology at Baylor University. Brook’s Jared Arend, will study Electrical Engineering at Texas A&M University, while Christine Tang, will study biomed or bioengineering at a yet undecided university. Lauren Gregurek, said she will study biology and Manna Flores plans to study nursing and become a Registered Nurse. DENNIS GAGE, host of Velocity’s “My Classic Car,” will serve as the 2015 Grand Marshal of the 20th Annual Keels & Wheels Concours d’Elegance May 2-3. “My Classic Car” will be filming an episode throughout the weekend with Gage meeting participants and visitors, signing autographs, as well as partaking in the awards programs . . . . Dr. Emily Smitherman, daughter of Charles and Joy Smitherman of Clear Lake and a former Lunar Rendezvous queen, has accepted a fellowship in Pediatric Rheumotology at the University of Cincinnati Children’s Hospital, one of the top programs and her No. 1 choice . . . . NASA astronaut and Harvard graduate Stephanie Wilson visited her alma mater Feb. 18 to take part in discussions focused on inspiring girls to pursue technology careers. . . .